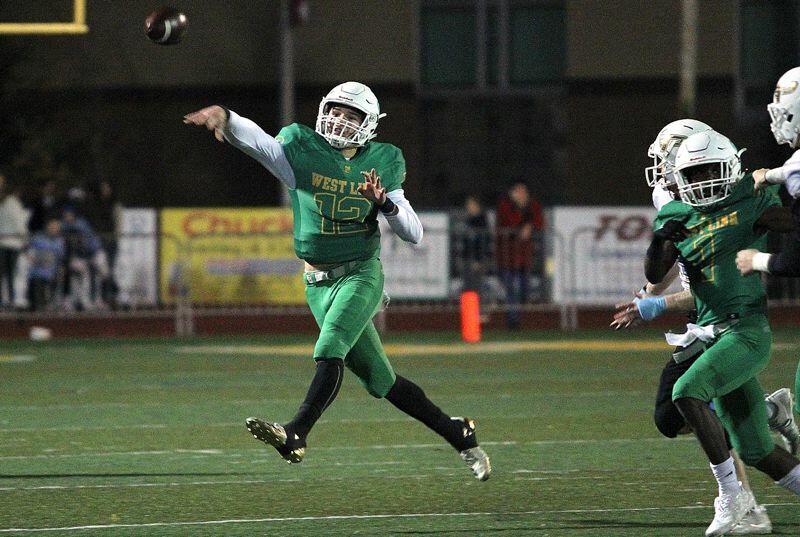 Turnovers have been the key to the West Linn football team's success all season long. When the turnovers have gone the way of the Lions' opponents, West Linn has struggled to win. When turnovers have gone in the Lions' favor — as they did Friday night — good things have happened. West Linn — taking advantage of a key Lakeridge turnover — scored 21 points in just 4 minutes, 19 seconds at the end of the first half and used that outburst to beat Lakeridge 55-20 in the second round of the Class 6A state playoffs on Friday night at West Linn High School. "I think (the key was) mental focus and preparation," said West Linn senior quarterback Ethan Long, who went 17 of 27 passing for 199 yards and three touchdowns. "We just hit a different level of guys just wanting it and caring and coming together as a group, as a family — that West Linn culture the team has had the past few years. So to see this group come out from a bunch of mixed guys, to come together to play for each other, it has just been awesome." "It does feel good," said West Linn senior running back Dawson Jolley, who ran 18 times for 120 yards and three touchdowns. "That's what we strive for, as many turnovers as we can get. That's going to help us win as much as we can." With the win — the sixth-ranked Lions' third straight — West Linn improved to 8-3 overall after previously finishing third in the Three Rivers League. Next up, the Lions will play No. 3 Sheldon (9-2 overall) in the state quarterfinals at Sheldon High School at 7 p.m. Friday. No. 11 Lakeridge, meanwhile, finished its season at 7-4 after previously tying the Lions for third place in the TRL. "We had some turnovers, they played good football and it wasn't seamless like we wanted it to be," said Lakeridge senior quarterback Charlie Maynes, who went 10 of 18 passing for 107 yards with one touchdown and one interception. "It's unfortunate, but we had a great season and I think that's what we need to remember." "I think that the fumbles and the missed snaps really brought us down," said Lakeridge senior wide receiver Andre Martinez, who made three catches for 29 yards and one score "After (those) touchdowns, people got their heads down a little and I think it just got into our heads and that's what led to us losing." In Friday's early going, however, it was the Pacers who held the upper hand. Lakeridge's defense forced a three-and-out on West Linn's first series and its offense followed with a 59-yard scoring drive that included five carries for 43 yards by junior running back Jalen John and ended when Maynes took a 3-yard keeper up the middle for the score and a 7-0 lead. The Lions answered with a 66-yard TD march on the ensuing series, a possession that saw Long complete two throws for 36 yards and ended when Jolley went over the left side on an option for a tackle-breaking, spinning 8-yard TD run. After a bad snap forced a miss on the extra point, West Linn had cut the Pacer lead to 7-6 with 4 minutes left in the first period. After two failed drives by each team, the Pacers extended their lead to 14-6 on a 37-yard John run up the middle that capped a 58-yard drive with 6:36 to go in the second quarter. The rest of the half, however, belonged to the Lions. First, West Linn went 65 yards to score its second TD, with Jolley picking up 26 yards on a dive and scoring from 8 yards out one play later to cut his team's deficit to 14-13 with 4:33 left in the half. Then, on Lakeridge's next offensive play, Maynes fumbled the snap from center and West Linn senior linebacker Elijah Ntsasa recovered at the Pacers' 23. From there, on West Linn's second play, Long hit senior wide receiver Jake Mastrandrea for a 25-yard score at the left flag and — following Abdul Ali's extra point — gave the Lions a 20-14 lead they would not relinquish. West Linn forced another three-and-out on the Pacers' ensuing possession and the Lions made Lakeridge pay again. This time, West Linn drove 67 yards in 13 plays, capping the march with a 9-yard Long throw to Tawa at the right flag for a 27-14 lead. "When Eli Ntsasa got that fumble recovery and then Jake Mastrandrea scored, that was huge momentum and we kept it going," said Tawa, who led his team with five catches for 46 yards. "We shoot for three (turnovers) but we got two today," Jolley said. "That's what we strived for in practice was holding onto the ball, making good reads for our quarterbacks and all that stuff." Things got worse for Lakeridge before they got better, too. The Lions dropped another 21 unanswered points on the Pacers in the third quarter, starting with a 21-yard Jolley run, continuing with a Long completion to senior running back Brodie Corrigan in the left flat that Corrigan turned into a 34-yard score, and then, a 1-yard Gavin Haines run to make it 48-14 with 42 seconds remaining in the third quarter. The Pacers answered in the fourth quarter with a 16-yard Maynes-to Martinez TD pass, but the Lions responded with a 14-yard scoring strike from junior quarterback Ethan Coleman to Clay Masters for the final 55-20 margin. While disappointed with the loss, the Pacers left proud of their many 2018 accomplishments — going unbeaten at home, winning the most games since 2013 and reaching the second round of the playoffs for the first time since '13. "It definitely was amazing. The senior class was, I can't even explain it," said John who finished with 166 yards and two TDs on 23 carries. "Our team has come a long way and it really shows." "Each year, step by step, we just took our time to see how we were going to develop as a team, but the one thing that helped us the most this year was we bonded as a team," Martinez said. "We got to know each other and because of that, we trusted each other on the field which just ended up with us being a great team." For the game, Long finished with 58 yards rushing on 10 carries, Gavin Haines added 10 more carries for 41 yards, and senior Cade Knutson added four catches for 43 yards. For Lakeridge, junior wide receiver Carson Mike made two grabs for 37 yards.